A House Democrat during a hearing on government IT reform Wednesday demanded that officials with the Agriculture Department explain recent restrictions on the ability of agency employees to work remotely, and suggested he would introduce a bill on telework “metrics” to reverse the decision, if necessary. 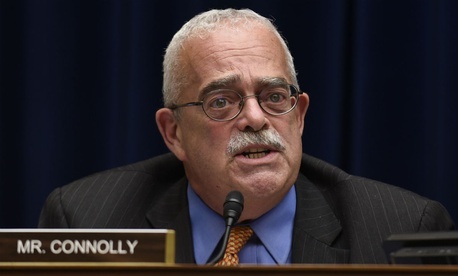 Rep. Gerry Connolly, D-Va., addressed executives at the agency during a House Oversight and Government Reform Committee hearing on Congress’ latest scorecard to measure implementation of the Federal Information Technology Acquisition Reform Act, asking how they squared Secretary Sonny Perdue’s decision to cut telework from effectively full time to one day per week with the agency being touted as an innovator in IT modernization. Donald Bice, deputy assistant secretary of Agriculture for administration, said he was “not aware of that particular incident,” and highlighted a number of exceptions to the new telework rules. Although the department’s new telework rule allows for exceptions, some employees at the agency headquarters’ South Building in Washington reported earlier this month that managers were hesitant to allow for additional telework while there was ongoing renovation and lead abatement in the vicinity of employees’ work space. Connolly reiterated that he opposed the changes to restrict telework, and suggested that if the agency does not restore a more flexible telework program, he would consider legislative action to reverse Perdue’s decision. Last month, Connolly told Government Executive that he was preparing legislation to protect telework programs across government for introduction in the coming weeks.